At this time of year I am looking even harder for those bargains. Do you give your children preloved items for Christmas? I have done in the past and will do again. I tend to use pre loved items in the stocking as stocking fillers. Right now I am keeping an eye out in charity shops for any Sylvanian family bits. Erin loves her Sylvanians and I have bought her some new for her birthday next week but I also look for bits that I can pop into her stocking. They are really expensive and also hold their value on Ebay so I find if I am lucky enough to find any in a charity shop it is a good thing to buy. However I haven’t had any luck yet! Although Argos 3 for 2 last week has helped me save some money. My bargain of the week is not a charity shop item this week but what I found on the high street. I was walking past Claire’s when I saw they had buy one get one free on their sale items. This is another treasure trove for me where I can fill up stocking fillers. Both my girls are really into accessories, hair bits and so forth in fact I think we have a problem in this house with just how many hair slides we have. I know they seem to adorn every side, shelf and pot in my house. In Claire’s I found these little hairs gems, they are sticky and I thought Chloe would like them. Chloe is really good at doing her hair, she often watches YouTube tutorials and then tries out the different things. She can now do fishtail plaits and french plaits on herself, something i have never mastered! They were reduced for £8.95 to just £3. I also then found these cute little My little pony stick on earrings. I doubt Erin will put them on her ears she is much more likely to use them in her crafts but at £5.95 reduced down and then it was buy one get one free anyway I thought she would like them. There you go two products original price of just under £15 for the bargain price of £3. I would love to see any of your bargains so do grab the badge and link up with Becky and me and we will tweet and share those that link up. Good luck with the charity shop quest. I am always on the look out for Beano and Dandy annuals. I shall have to get myself to Claire’s ! We get through hair clips at an impressive rate as my daughter is forever losing them at nursery – they usually have a few good three for two deals as well. I like this post. Im a huge bargain hunter! 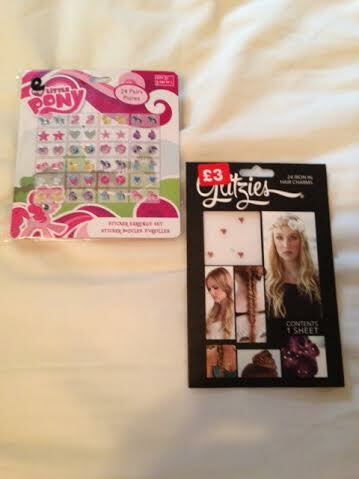 I’m sure my daughter would have loved those stickers as she is a huge My little Pony fan! I’m an eBay queen myself! Love a pre loved bargain myself, kids toys are expensive. Sarah Golding recently posted…Christmas is coming! I love those hair gems, I am such a big fan of My Little Pony! Looking in charity shops is a very good idea, I’ve had some amazing bargains in charity shops! Also, I’ll be linking up to this linky in the very near future. I LOVE a good bargain, hehe.